Executive leadership has been historically fraught with obstacles. No executives know this better than life science leaders. A consistently growing industry, pharmaceutical, biotech, and medical device executives are faced with changing legislative climates and business expansion on a daily basis. In the Bay Area, these challenges are aligned with numerous advantages including funding and advanced technology. It isn’t news that startups are making waves in the Bay Area. Due to available funding and an enriched location, healthcare and life science businesses, in particular, are finding their niche in the tech capital of the world. Healthcare startups are faring so well in the Bay Area that the most successful are placing their headquarters in San Jose, San Francisco, Palo Alto, and other surrounding cities. Life science companies specializing in pharmaceutical and biotechnology development saw an influx of over 2 billion dollars in 2016 alone from various investment deals. These investments are helping life science and technology comprehensively cohabitate to bring better healthcare to the patients that need it. Life science startups are fueling a diverse leadership in Silicon Valley dedicated to the patient. Bay Area healthcare startups have started neighboring with consumer giants, in attempt to expand the industry’s regional footprint. Along with unending investment opportunities, companies moving to or headquartering themselves in the Bay are likely to coincide with technology investors. Many of these instances are prompting new biotech companies focused on computing in disease detection and diagnosis. Executives heading the biotech movement in Silicon Valley are taking advantage of the many resources this area has to offer. Companies are expanding the definition of healthcare to the patient through mobile apps, in-home devices, and consistent data monitoring to offer the best products possible. Recent innovations include biochemical analyzation equipment and synthetic DNA storage, proving Silicon Valley is leading the world in the race to combine technology and life science. With an abundance of tech-focused resources and capital funding, executives are racing against each other to create the latest –and best, products on the market, they’re still expanding the industry and changing the way we see healthcare. Difficulties surrounding executive leadership in the Bay Area do not go unnoticed. Though companies are popping up at a groundbreaking rate, the area has yet to adapt. Leaders are wondering where businesses can expand while still keeping their thumbs on the industry’s heartbeat. Contemplating the physicality of the Bay Area is not done without also comprehending the varied resources at hand. Though Silicon Valley is current home of technology, academia is helping companies take their ideas to the scientific level. The Bay Area itself comprises the most important aspects to the life science industry, providing heavy competition and increased innovation. Global industry leaders are faced with many challenges throughout their business plans. In the Bay Area, these plans are facing obstacles and advantages in the form of physical growth, funding, and the technology to take the industry where it’s never gone before. 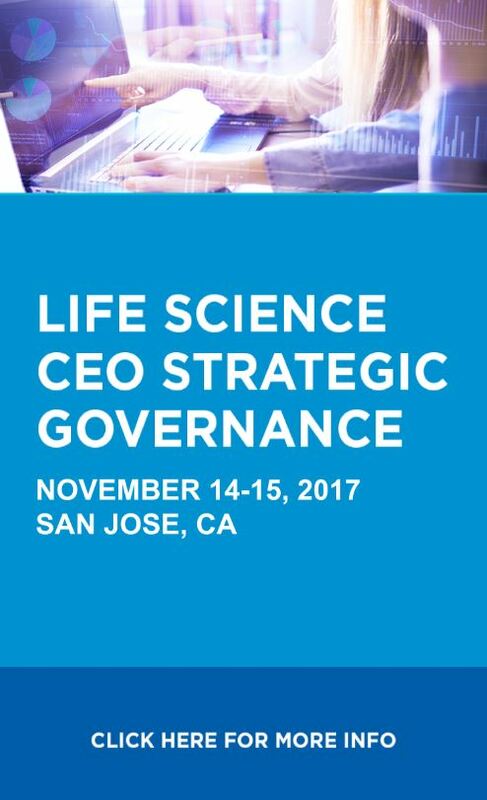 To learn more about leading life science in the Bay Area, or to engage with like-minded executives in a boardroom discussion event, register for the Life Science CEO Strategic Governance Forum, in San Jose, CA.